Today for #SundaySupper we are celebrating Mom’s! Today is such an important day to celebrate the woman who brought you life, the one who takes care of you no matter what your age is and the one who loves you for you, no matter what you do! Today I will not be celebrating Mother’s Day with my Mom, not because I’m to busy or because I don’t want to, but because we live 3000 miles apart. It’s hard being so far away from my Mom, she’s my best friend, and I miss her very much! Now that I am starting to get a little mushy, I thought I should share with you a recipe that I made especially for celebrating Mother’s Day! This is my Blueberry Coffee Cake. This cake is light, moist, sweet and chock full of my second favorite spring berry, next to Strawberries of course. I have had this recipe floating around in my head for weeks and I thought today would be a perfect day to share it with you. 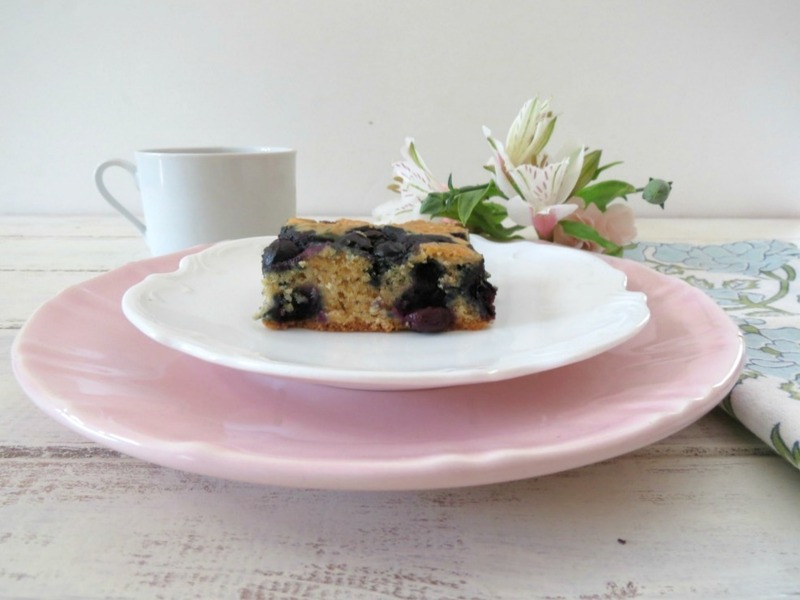 Nothing beats sitting with a good cup of coffee or tea and having a light, low calorie piece or two of Blueberry Coffee Cake as you sit with your Mom and gossip about all your family members. Yes, I said gossip, you know you do! When making this recipe, I had the idea of what and how I was going to make this recipe, but when I made it, I realized I didn’t have enough batter to do what I planned. So I took a chance and made it anyway! This cake exceeded my expectations!! I was so happy on how puffy it got, and I when I took it out of the oven, I almost fell over on how beautiful I thought it was. Little Jenny who doesn’t like blueberries, said it looks delicious, especially for blueberries. Here it is fresh out of the oven. I wish you could have smelled it. I have learned a key to baking, is smell. Once you get that oh my gosh smell, it’s normally pretty close to being done! This cake is also very easy to make and it bakes up in 20 minutes, so if your in need of a quick cake this is the cake for you. If you want to be fancy, bake it in a round pan. I actually wanted to do that, but or the life of me I can’t find my cake pans. I have looked everywhere and they simply disappeared. So annoying. Maybe for Mother’s Day I’ll get some new cake pans?? Even though I am not officially a Mom, I do have two step-daughters and two BAD dogs, which I think is a lot more work then kids, ok, maybe not! But my gosh, could they be anymore bad? 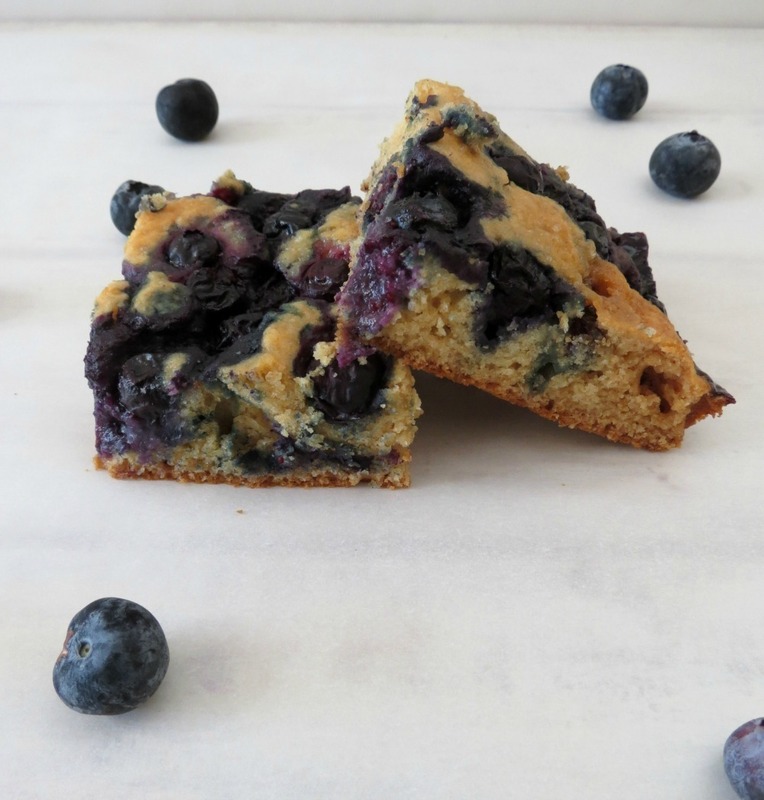 A light, fluffy, healthy cake chock full of juicy blueberries. Using an electric mixer, beat the coconut oil, butter and sugar. Beat in the vanilla extract and egg until blended. Add the flour mixture in three additions, alternating with the coconut milk, beating after each addition until just combined. Spread the batter in the prepared baking dish. Lay 1 cup blueberries on the batter and sprinkle with turbinado sugar. Bake the cake for 20-23 minutes or until it is golden brown. I want to wish my Mom a very Happy Mother’s Day! I think you are the best Mom ever and I miss and love you very much!!! To all the Mom’s out there, including the ones with no kids but pets and Husbands, because your still a Mom to me, I wish you the most wonderful day ever! Sit back, relax and make sure your family takes care of you today. This is your special day, a day to celebrate YOU! Oh, I almost forgot, don’t forget to check out the #SundaySupper recipes! I can’t wait to see what special dish they will be serving on this Mother’s Day! P.S. Here’s a picture of my Mom and I. Join the #SundaySupper conversation on Twitter on Sunday, May 12th to celebrate Mother’s day! We’ll tweet throughout the day and share recipes that celebrate mom. Our weekly chat starts at 7:00 pm EST. Follow the #SundaySupper hashtag, and remember to include it in your tweets to join in the chat. Check out our#SundaySupper Pinterest board for more delicious recipes and food photos. I love the pic of you and your mom! And I love blueberries and coffee cake. Made one a month or so ago. I love how yours is LOADED with blueberries…that’s the best kind of cake! I could go for a piece of this right now! I’m a sucker for blueberries. Oooh, your coffeecake looks marvelous, Jen! So chock full of blueberries!!! Great photo of you and your mom! A wonderful combination! Must have been so delicious!! Lovely photo of you and your mom! You coffee cake looks and sounds delicious. It’s funny I’m not a fan of plain blueberries but put them in pancakes, muffins, or coffee cake and I love them! I just made blueberry pancakes for breakfast and I would seriously eat like 4 pieces of this right now. I want to try thjis with the coconut milk, sounds so good! Mmmmm…what I wouldn’t give for a big ol’ slice of this with my coffee right now, it looks amazing, Jennifer! 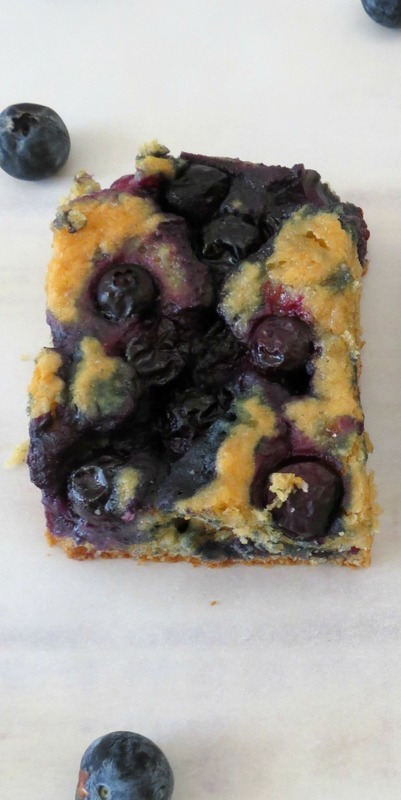 An excess of blueberries in a coffee cake? How can that possibly be bad, especially if it´s for your lovely mom! We should change the name from snack cakes to gossip cakes, much more fitting in my opinion. And I love the comment about your bad dogs…it cracked me up! Saving for my extra berries at the end of Driscoll Berry Week! Michael would love this for his breakfast. I’m also celebrating with mom from afar, so I know you feel. This cake looks amazing, I can’t say no to anything with blueberries and you use all the blueberries here! What a wonderful picture of the two of you! I can relate as to how hard it is to be far away from family as I am also a few thousand miles away from mine. Your blueberry coffee cake looks absolutely amazing and – I think – we will make it right now!!! Yay! Thank you so much!!! Have a great day! Ahhh thanks Bea! I know it’s so hard to be away from family! I need to make a better effort to go visit. I was just thinking I needed to make a coffee cake again. And it just so happens I have a carton of blueberries in the fridge. Looks like I know what I’m doing for the next hour! Thank you Soni! I love cooking and baking with coconut milk, it makes it more richer! This cake has my mouth watering! I cannot believe it’s only 124 calories a piece. That means I get two or three pieces, right? 😉 My mom is resigned to the fact that she will be taking care of me forever! lol, You have to love Mom’s they are the best!!! And yes you can have more than one piece. Your blueberry coffee cake looks fantastic!! 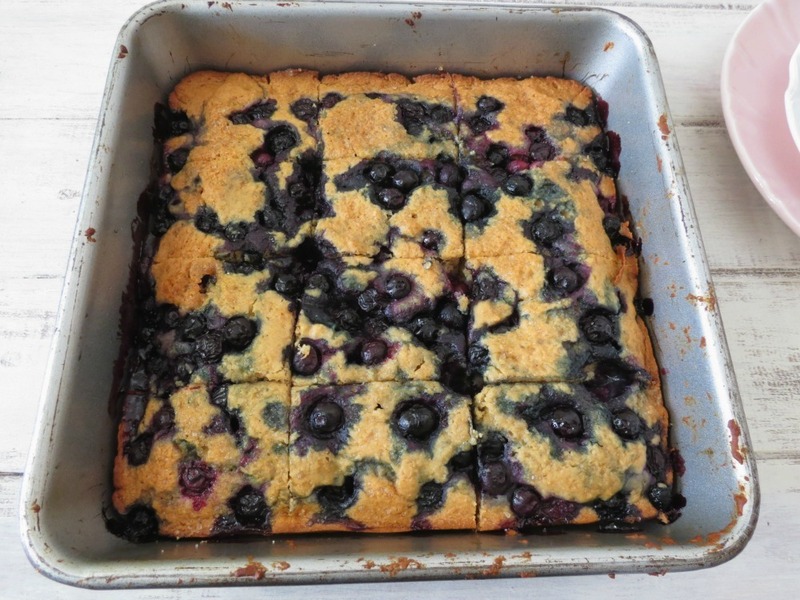 It’s loaded with gorgeous blueberries, and I love that you used coconut oil and coconut milk!! I’ve never worked with the sugar alternative you mention as what you used. I’ll have to look into that! I love the NuNaturals Presweet Tagatose. You wouldn’t know it’s not sugar! 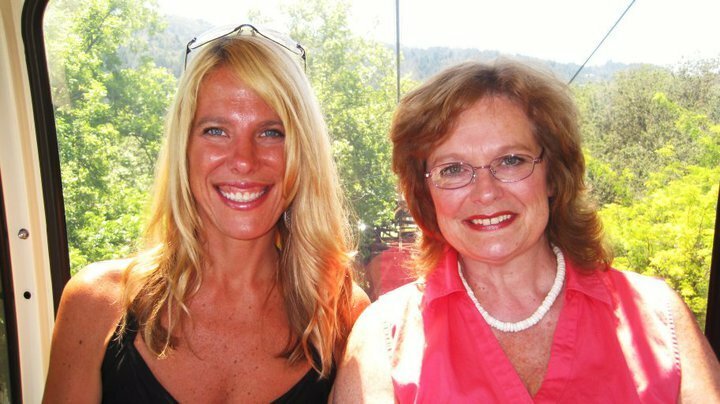 Love the picture of you and mom, both so pretty!! 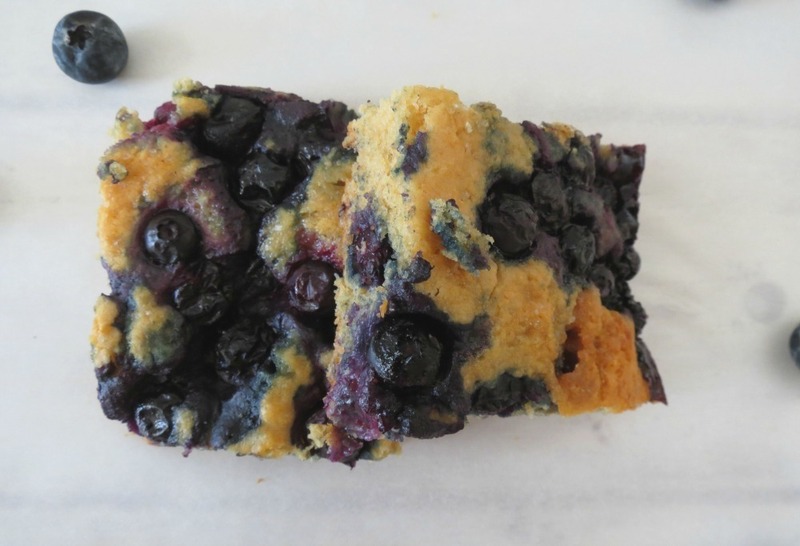 Your coffee cake looks so good and sooooo full of blueberries, I love it!! 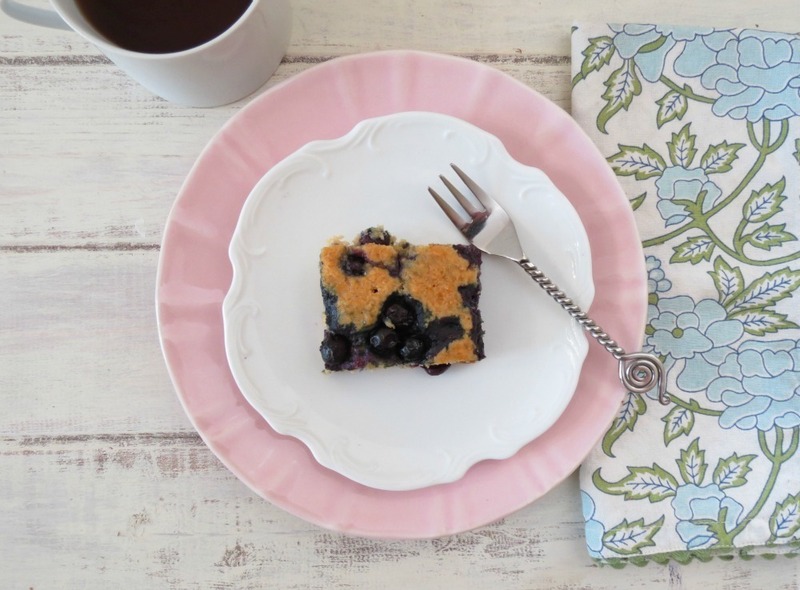 I am all about the coffee cake, and blueberries are my mom’s favourite fruit! The cake looks delicious! I love blueberries. That is a gorgeous looking cake!!! I love blueberries so much!!! WOW, that is PACKED with blueberry goodness, YUM! I finally have the opportunity to start reading through everyone’s posts. Yours is the first, Jen, and if this is an indication of what’s to come, I’m going to be very teary and emotional today! I loved reading about how much you love your mom. No matter how old we are, where we are, what we’re doing, the one person who will always love, comfort and support us will be our wonderful moms. I’m sorry to hear you live so far away from her! Your cake looks amazing – I can’t believe it’s so low-cal! I can’t wait to make this! And seriously – having a four legged kid is a TON of work and you have two of them! I laughed over how BAD you said they were, I think I need some examples 😉 I hope you had a fabulous Mother’s Day! I hope she read my post too! 🙂 As for the dogs, my gosh they are bad!!! But you gotta love them! I love blueberry coffee cake! Perfect for Mother’s Day! Totally dig this recipe. And the photo of you and your mama is lovely. Happy Mother’s Day! You look so happy together 🙂 Lovely recipe, I hope your mum enjoyed, ok I’m sure she did. Ahhh thank you Marta, your too sweet!!! What a beautiful picture of you and your mom… I would love this blueberry cake any day of the week with a cup of coffee. Ahh Thank you Isabel! That’s so sweet! That looks luscious! Great recipe for #SundaySupper! So many gorgeous blueberries in this coffee cake – the perfect way to start a day I say! Thank you Katie! One thing I love about this time of year is the berries! I can’t get enough of them!! Sorry you didn’t get to spend Mother’s Day with you mom. Maybe next year you can. Thanks for sharing a healthy coffee cake. I love them yet don’t indulge often because it is usually such a splurge. Thank you Renee! Yes, next year I’m going to make an effort to visit my Mom!